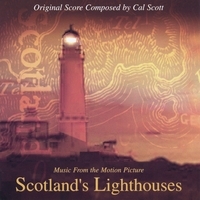 This wonderful CD is a collection of waltzes, airs, jigs and reels from the film "Scotland's Lighthouses". It includes traditional Scottish and Irish tunes as well as original compositions by Cal Scott. The players include Skip Parente on fiddle, Phil Neuman on penny whistle and recorder, and Cal Scott on guitar, piano, and cittern. All three are members of The Trail Band, the popular historic folk band from the Pacific Northwest. (Check out their page elsewhere on CD Baby). Also featured is Rob Barrick, an award-winning piper playing both Highland pipes and Scottish small pipes. Cal Scott is a multi-instrumentalist and composer who has scored over 30 specials and documentaries for PBS, and is the musical director of The Trail Band. He plays on Patrick Street's new "Street Life" CD, and has performed with Kevin Burke and Tom Paxton. For more information about the film, "Scottish Lighthouses," please visit morganvideo.com. What a wonderful collection of the music that really details the beauty of Scotland. Can Scott is such a talented musician and writer. His love for music comes out in his songs. You have to get this one. Love to put it on when the fire is glowing and family is hanging out together in the parlor.